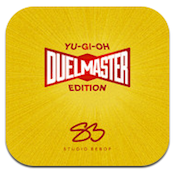 Duel Master: Yu-Gi-Oh Edition is an iPhone app developed byStudio Bebop. 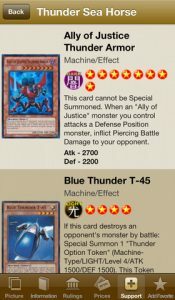 You can use Duel Master to look up the details of any Yu-Gi-Oh card, as well as card descriptions, tournament statuses and rulings, and current prices. Yu-Gi-Oh is a anime series and collectible card game, somewhat similar to Pokemon or Magic: The Gathering. In this game, two players Duel each other using a variety of Monster, Spell, and Trap Cards to defeat their opponent’s monsters and be the first to drop the other’s Life Points to 0. 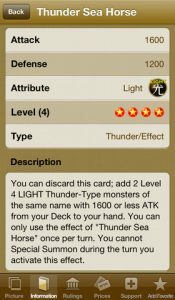 There are well over 5,000 Yu-Gi-Oh cards out there, so having an app that helps you navigate this massive library of cards is a real boon. But what’s really great is that you don’t have to rely on browsing or search to find the card info you’re looking for: you can take a picture of the card, and then the information will pop up automatically. It’s great for both cards in your collection, as well as cards you are looking at online. Trading and card pricing is a big part of any collectible card game community, and Duel Master: Yu-Gi-Oh Edition nails that aspect. There’s a trade calculator that tells you who’s getting the better end of any deal, and all card prices are linked to what the cards are currently being sold for on eBay. 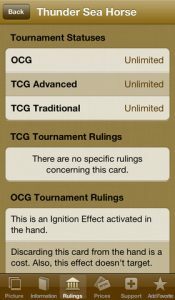 If you’re a competitive player, Duel Master: Yu-Gi-Oh Edition provides the tournament status and rulings for any card, so that you know which cards are banned before any game. 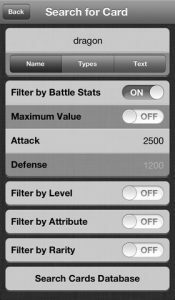 If you’re a Yu-Gi-Oh player, you need this handy app. It’s up-to-the-minute, packed with tons of info, and even lets you make custom searches by name, type, description, set, attack, defense, or rarity. Duel Master: Yu-Gi-Oh Editionis compatible with iPhone 3GS, iPhone 4, iPhone 4S, iPhone 5, iPod touch (3rd generation), iPod touch (4th generation), iPod touch (5th generation) and iPad. Requires iOS 5.0 or later. This app is optimized for iPhone 5.